Four movies deep, The Conjuring universe is now widely considered to be a cornerstone of Hollywood’s horror scene. Not bad for a film franchise that flickered into life only four years ago. In that time, James Wan (Aquaman) has delivered The Conjuring and its sequel, The Enfield Poltergeist, while director John R. Leonetti broke course to focus on the nightmarish little doll known as Annabelle. A worldwide haul in excess of $256 million was enough to warrant a sequel (read: Annabelle: Creation), which is now available via Blu-ray and DVD. 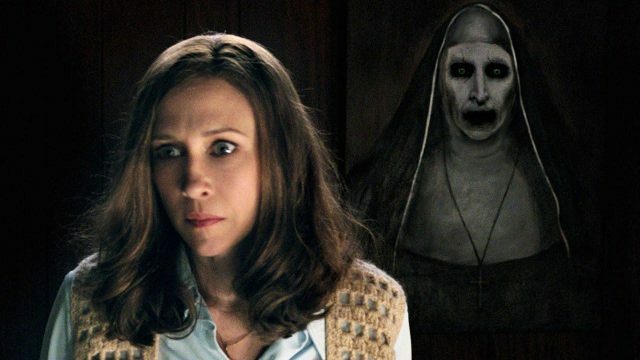 Not only was it another feather in New Line’s cap – Creation topped its predecessor’s haul by almost $50 million at the global box office – but David Sandberg’s chilling follow-up helped expand The Conjuring universe into uncharted territory. Next up? The Nun, which recently got hit with a delay, pushing it from July 13th to September 7th. Set within the universe created by Chad Hayes and Carey W. Hayes, we don’t know too much about the pic just yet, but during a recent appearance on The Movie Crypt podcast, director Corin Hardy let a few new details slip, teasing that the film will favor practical effects over CGI – which is great to hear. Headlined by an all-star cast that includes Taissa Farmiga, the sister of series stalwart Vera Farmiga (Lorraine Warren), Demian Bichir, Bonnie Aarons, Charlotte Hope, Jonas Bloquet and Ingrid Bisu, The Nun will be unleashed upon horror fans the world over on September 7th. Beyond that, there are also plans in place for a third Conjuring movie and The Crooked Man, neither of which have firm release dates at this time.